Anne Coudrain, B. F., Zbigniew W. Kundzewicz (2005). 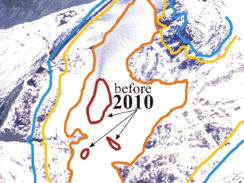 "Glacier shrinkage in the Andes and consequences for water resources - Editorial." Hydrological Sciences50(6): 925-932. -For a typical mid-latitude glacier, a 1 C temp rise would have the same effect as much greater decreases in cloudiness (30%) or precipitation (25%). -Glaciers advanced in the 1990’s due to enhanced precip in Norway from a large positive phase of NAO but recently have been shrinking. -Andes experience ablation throughout the year in their lower regions unlike pacific northwest volcanoes. -Glacier mass balance is strongly controlled by climate variability at decadal time scales – driven by ENSO. -Energy balance investigations show that melt is primarily from net radiation (fraction of incident solar radiation absorbed by the glacier) – why albedo is so essential. -Glaciers store 69.9% of the world’s freshwater (nearly 25 million km3). For mid and low latitude regions the equivalent water volume of the glacial ice is 0.2 million km3, which is over 100 times more than that of the rivers .0017km3. -The mean global sojourn time of a water particle in a mountain glacier is of the order of 1600 years. -This all may lead to water shortages in the future. Most of this paper dealt with the Andes but it had some good facts about water resources stored in the world’s glaciers I noted above. No real questions for this paper. It was pretty straightforward.